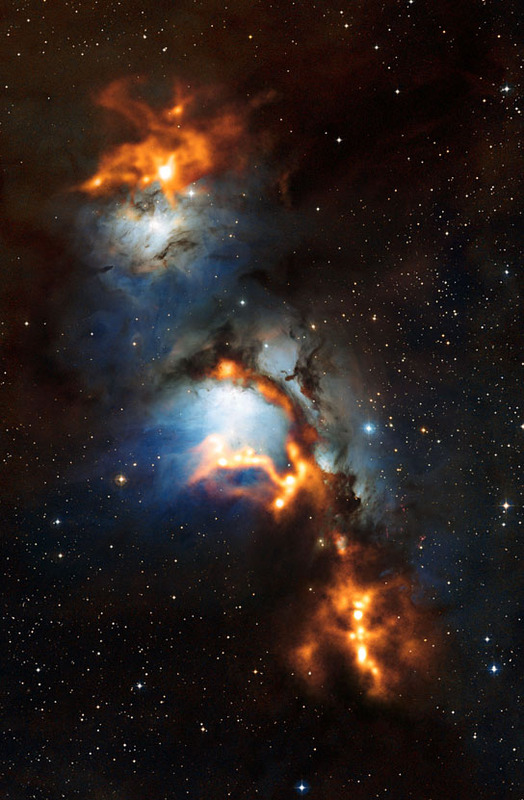 New images captured by Atacama Pathfinder Experiment telescope show clouds of cosmic dust threaded through the nebula Messier 78. The images were created by overlaying the APEX observations on a visible-light image in orange, allowing astronomers a closer look for studying the dusty clouds in which stars are born. Dust may sound boring and uninteresting — the surface grime that hides the beauty of an object. But this new image of Messier 78 and surroundings, which reveals the submillimeter-wavelength radiation from dust grains in space, shows that dust can be dazzling. Dust is important to astronomers as dense clouds of gas and dust are the birthplaces of new stars. In the center of the image is Messier 78, also known as NGC 2068. When seen in visible light, this region is a reflection nebula, meaning that we see the pale blue glow of starlight reflected from clouds of dust. The APEX observations are overlaid on the visible-light image in orange. Sensitive to longer wavelengths, they reveal the gentle glow of dense cold clumps of dust, some of which are even colder than -250ºC. In visible light, this dust is dark and obscuring, which is why telescopes such as APEX are so important for studying the dusty clouds in which stars are born. At the top of the image is another reflection nebula, NGC 2071. While the lower regions in this image contain only low-mass young stars, NGC 2071 contains a more massive young star with an estimated mass five times that of the Sun, located in the brightest peak seen in the APEX observations. The APEX observations used in this image were led by Thomas Stanke (ESO), Tom Megeath (University of Toledo, USA), and Amy Stutz (Max Planck Institute for Astronomy, Heidelberg, Germany). For more information about this region as seen in visible light, including the recently discovered — and highly variable — McNeil’s Nebula, see eso1105. Be the first to comment on "APEX Provides Images of Dust near Orion’s Belt"